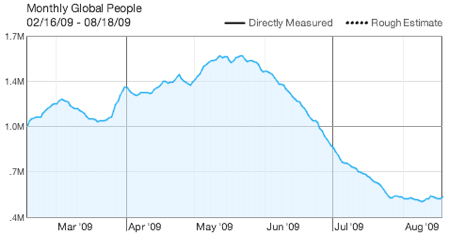 Aug. 21, 2009, 8 a.m.
Why did Newser’s traffic fall off a cliff? By Zachary M. Seward @zseward Aug. 21, 2009, 8 a.m. Which is fair enough, except that very few people are coming to Wolff’s site these days. As you can see in the chart above, Newser’s traffic has tumbled since peaking at 1.6 million people in May. It now stands at 546,000 monthly visitors, according to Quantcast, well behind other news aggregators with which it’s frequently lumped, including: The Huffington Post (13.2 million), Topix (9.3 million), and Mahalo (8.2 million). Now, I wouldn’t normally highlight this, but I think it helps to demonstrate that not all traffic is created equal (just as “not all links are created equal“). Even when Newser was doing just average, two thirds of its readership was apparently the product of syndication deals. Similarly, while Politics Daily has been praised for amassing a huge audience in its first few months, the majority of that traffic comes from the site’s corporate parent, AOL. And there’s nothing wrong with those arrangements, but they’re a far cry from loyal readership. When the firehose is shut off, the traffic disappears. POSTED Aug. 21, 2009, 8 a.m.
Seward, Zachary M.. "Why did Newser’s traffic fall off a cliff?." Nieman Journalism Lab. Nieman Foundation for Journalism at Harvard, 21 Aug. 2009. Web. 20 Apr. 2019. Seward, Zachary M.. "Why did Newser’s traffic fall off a cliff?." Nieman Journalism Lab. Last modified August 21, 2009. Accessed April 20, 2019. https://www.niemanlab.org/2009/08/why-did-newsers-traffic-fall-off-a-cliff/. | title = Why did Newser’s traffic fall off a cliff?